Dubai, United Arab Emirates – Philips, the global leader in lighting solutions, today announced the launch of its innovative remote lighting management system, CityTouch, which uses mobile and cloud-based technologies to control street lighting. The new technology supports today’s vision on sustainability and livable cities. The lighting solution enables cities to save energy, reduces maintenance, and improves safety on streets, due to better visibility, and enhances operational efficiencies. Part of the CityTouch solution is CityTouch connect application (app), a remote lighting management system that acts as the control center for adjusting and monitoring your city lighting. It communicates with various assets of the lighting system via the public mobile communications network – interactively and reliably. Once installed, it allows users to control all connected lights via the app, which offers information relating to the functionality of each individual light fixture, from energy consumption to faults. Cities consume more than 70% of the world’s energy supply, making energy efficient infrastructure more important than ever before. 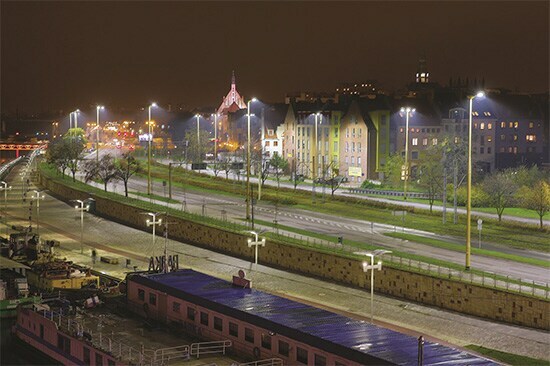 “Intelligent lighting is the future of sustainable city lighting. CityTouch connect app not only allows dynamic, intelligent and flexible control of street lighting with dimming control and schedule setting, it also provides the precise amount of light needed at any place and time, saving energy and providing the right level of visibility on the roads,” commented Rami. While already in use in more than 31 countries the CityTouch solution has helped cities, such as Los Angeles and Madrid, to better manage their energy consumption, improve the city’s livability, and safety, and reduce their costs. The smart “plug and play” approach, possible with the CityTouch Ready luminaire, not only reduces the cost of programming each fixture, it also reduces the time it takes to commission the CityTouch connect app from days to minutes by eliminating the need for on-site commissioning. Furthermore, the entire system can be securely controlled and managed remotely through any web browser. Taking the management of LED street lighting to the next level, the Philips CityTouch connect app supports the city’s energy efficiency initiatives and increases safety through uptime. At the same time, its effect on the streetscape is hugely beneficial, contributing to more vibrant and engaged communities. For more information about CityTouch connect app, visit www.philips.ae/CityTouch. Royal Philips (NYSE: PHG, AEX: PHIA) is a diversified health and well-being company, focused on improving people’s lives through meaningful innovation in the areas of Healthcare, Consumer Lifestyle and Lighting. Headquartered in the Netherlands, Philips posted 2014 sales of EUR 21.4 billion and employs approximately 105,000 employees with sales and services in more than 100 countries. The company is a leader in cardiac care, acute care and home healthcare, energy efficient lighting solutions and new lighting applications, as well as male shaving and grooming and oral healthcare. News from Philips is located at www.philips.com/newscenter..